Ctrl+Right moves the cursor to the beginning of the next word. A bookmark is a named location or text fragment in your document. Bookmarks are used for reference and navigation purposes. You could use bookmarks for quick navigation between different locations of your document. Also bookmarks can be referred by hyperlinks and tables of contents. Learn more... . If you would like to associate a new bookmark with a text fragment, select that fragment before creating the bookmark. Otherwise simply click the desired location. 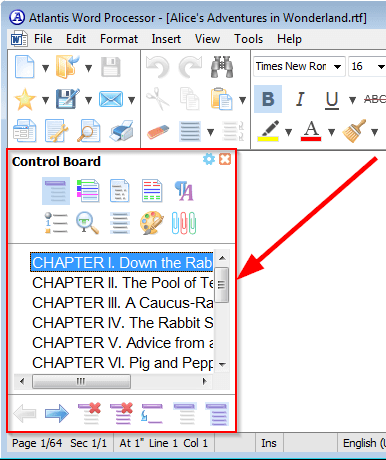 Learn more... . Just double-click the desired bookmark name displayed in the Bookmarks panel to be brought to the corresponding location in your document. Note that individual bookmarks are quickly displayed in the bookmark list by typing the first characters of their name. Press Ctrl\ (NUMPAD) or Ctrl* (NUMPAD) hot keys. Learn more... . There you could remove and rename bookmarks, change the sorting order of bookmarks in various bookmark lists. Through the Bookmarks panel you can also format the current document selection as hyperlink to the required bookmark. Clicking such a hyperlink automatically brings you to the corresponding bookmarked location in your document.